With an overall score of 8.46, Fürst Toto, who is radiantly beautiful and always appears with tremendous sovereignty, belonged to the top group of his incredibly strong 14-day test in 2018 in Schlieckau, confirming the high assessment at his licensing in 2017 for his pedigree and conformation. We are eagerly awaiting the first crop of foals of this very promising young stallion. 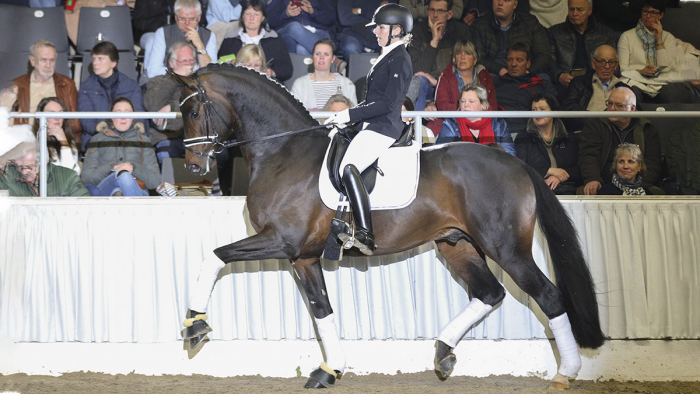 From the very beginning, his sire Fürstenball made an impression on dressage horse breeding. Record-priced auction foal, Oldenburg licensing and main premium winner, German Champion, finalist at the World Championships for Young Horses and victorious at advanced (S) level up to Prix St. Georges, he has produced over 60 licensed stallions, including numerous winning and premium stallions as well as top-price stallions of the Stallion Market. Dam sire Totilas won double gold at the European Championships in Windsor/GBR in 2009 and triple gold at the World Equestrian Games in Lexington/USA in 2010. Grand-dam Lasira is the half-sister of Lord Schufro OLD (by L’Espoir), licensed stallion, Oldenburg Reserve Champion and placed twice at the German Championships. Fürst Toto: The path to the top is clearly mapped out. Fürst Toto is stationed at Deckstation Paul Schockemöhle in Mühlen.